What's Your Online Business Archetype & Why Does It Matter? 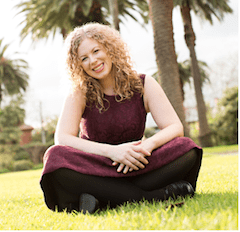 Episode 12 – What’s Your Online Business Archetype & Why Does It Matter? The first thing I’ll say is if you straight up just want the answer to that what your archetype is go to catleblanc.com/quiz and you’ll get your answer. But if you want to know why it matters too stay here first! The Your Business, Your Rules Podcast is all about living life your way and building a business your way, to enable you to live life even more your way. Lots of doing things your way! But in order to actually do things your way you actually need to pay attention to who you are. Otherwise you end up missing the point and following someone else’s dream. Maybe I should be doing that… That person is having success doing that, I think I’ll do that too. Or clearly I need to be more “bubbly/wear different clothes/take my pictures that way/do this thing/act that way/straighten my hair (no! )” or whatever it is. It’s easy to forget – just because it works for that person doesn’t mean it’s right for you. Let’s say you’ve had a scrolling session on Facebook and now you’re in a webinar talking about ‘visibility’. The person running the webinar hid in her business until one day she made a decision to be more visible, did that, then her business exploded. Awesome! That’s wonderful. Truly. For her. But what if the idea of blasting yourself across every social media channel makes you want to die inside? There’s a difference between stretching your comfort zone and forcing yourself to be someone you’re not. That’s why it’s so important to do this in a way that isn’t a fundamental contradiction to how you want to be showing up in the world. Meaning – Don’t follow someone else’s dream. In the first episode of Your Business, Your Rules we talked about the fact that some things in business are fixed – the numbers need to add up and you can’t go against basic human psychology, but what business you start and how you want to run it you get to do your way. You get to choose a niche that fits you. You get to run your business according to your values. And you decide where and how you want to work. Just because someone else works successfully from a co working space doesn’t mean it’ll work for you. Just because someone else is making a killing as a Health Coach helping people with a particular niche it doesn’t mean it’s necessarily the right niche for you. And just because someone else is running a visibility strategy to get leads it doesn’t mean it’s the best choice for you. It’s called the Online Business Archetype Quiz. And it’s fun! These aren’t hard and fast rules and part of me is against putting labels on people but these groupings are helpful to see what leanings you have and know you like to do things. Want to hear what they are? The Online Rockstar is the independent type. They don’t care for tradition or social status and more than any other archetype want to make their own rules. The Superstar Coach is the most glamourous of the archetypes. There absolutely can be a level of ‘fame’ and attention that comes with being an online personality and the Superstar Coach loves to lap it up. The Spiritual Guide is answering a calling in doing the work she does and is the most intuitive of the archetypes. The Creative Powerhouse just can’t seem to stop making stuff. But isn’t necessarily great at getting her stuff out there. She is unsurprisingly the most creative of the archetypes. The Secret Weapon likes to be more behind the scenes. She’s talented and respected but doesn’t necessarily want the spotlight on her. She’s the most of the diligent of the archetypes. The intention is to show you that there are many ways of doing this. If you’re a Secret Weapon you can start an online business and be behind the scenes. You can be a Superstar Coach and have a following of thousands and have super fans. You can be the more alternative type and make a success of it. Looking at you the Online Rockstars. If you’re a Spiritual Guide there is potential to monetize your gifts. And if you’re a Creative Powerhouse there is likely a way to harness that Creativity in a way that supports you. The message is to do it your way. Honour who you are, don’t go against it. It’s very unlikely that you want a location independent business so badly you are prepared to turn into a different person to do it. 99.9% of us just don’t have that level of drive. Let’s be realistic. At the point where we have to do something that feels like we’d have to be a different person we will just put it in the too hard basket. For example I am now thinking I might like to do speaking at some stage, whereas before I would rather cut my own arm off than do that. So yes, be open to growing, yes prepare to expand your comfort zone. Expect to be uncomfortable at times. But don’t feel at any time that just because someone else is doing something and at least appearing to do well with it that that makes it by default a good choice for you. 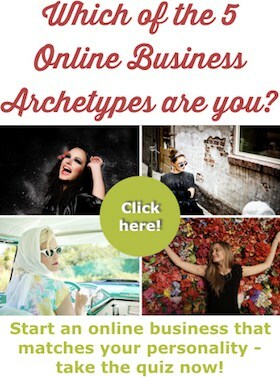 If you’d like to know your Online Business Archetype go over to catleblanc.com/quiz and take the quiz. I’ll also send an email with some personalized resources for your archetype and for the stage of business you are at. Want to share your archetype? Let us know below!